You will feel the fear of some local haunts. One of Philadelphia's most treasured museums is preparing for its own night of mischief. We take you inside the world of wizardry and magic, summon spirits on a ghost tour down the shore and look inside Philadelphia's first post-apocalyptic restaurant. It's a Halloween FYI for you Sunday, Oct. 15th at 1 p.m. and midnight on 6abc. Mullica Hill is home to New Jersey's largest Haunted attraction. Night of Terror at Creamy Acres in Mullica Hill is one of the region's largest Halloween experience, featuring seven haunts that will be sure to scare. Karen Rogers takes us for a tour. Normally Spring Mountain is a fun place for skiing but in October it turns into Scream Mountain. The Spring Mountain Ski Resort has transformed into the haunted attraction Scream Mountain. 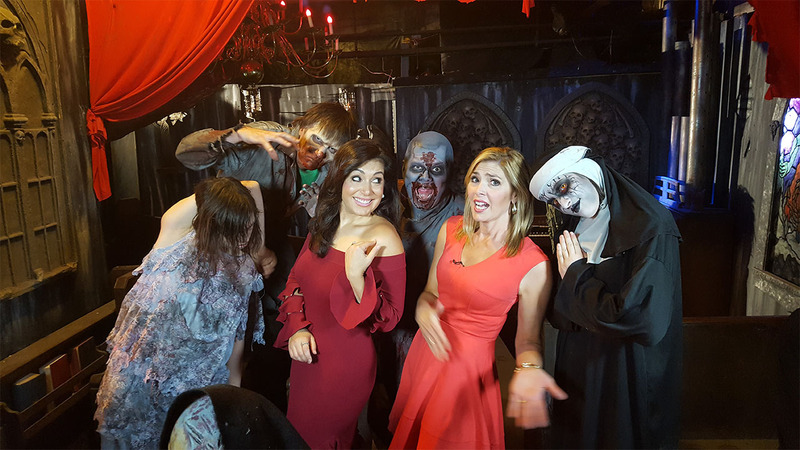 Melissa Magee braves the darkness to experience the haunted hill. A trip to the shore and a visit to Cape May has plenty of ghostly allure. Cape May is America's first seaside resort and is said to be one of the most haunted places in America. Karen Rogers investigates the paranormal activity. If you're looking for a meal that might get you in the Halloween Mood we found a new spot in Fishtown. Philadelphia is home to the country's first post-apocalyptic restaurant. Jeannette Reyes gets a look inside Mad Rex. It's 11 days of movies from all genres and this time of year the fear flicks are always a big hit. Movie buff alert! The Philadelphia Fest is Oct. 19-29, with 11 days, 100 films, many never before seen in Philadelphia! The annual Harry Potter Festival is coming and even muggles are invited. It's a full-on Harry Potter love fest in Chestnut Hill. Alicia Vitarelli shows us how the suburban town goes from the muggle world to the wizarding world for one magical weekend. Two local magicians have opened a Center for the Magical Arts with a first-of-its-kind theater. A first-of-its-kind theater in the United States is calling Montgomery County home. Jeannette Reyes takes us inside the enchanting new entertainment venue Smoke & Mirrors Magic Theater. Check out the fun Halloween-themed events coming to the Mutter Museum. Halloween and The Mutter Museum are almost synonymous. Alicia Vitarelli checks out medical curiosities like Albert Einstein's brain and the 40 pound colon that make the museum so popular, and, a special mischief-filled night of fun.